The camera rotates around a complex looking system of pipes. It looks like a construction that you would find in a factory. An interesting motion graphic for technologically themed events. This video loop will add the finishing touch to your production, a great piece for your video moodboards. 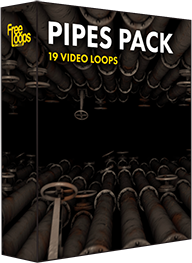 This video loop is part of Pipes Pack.